What Day Of The Week Is September 26? 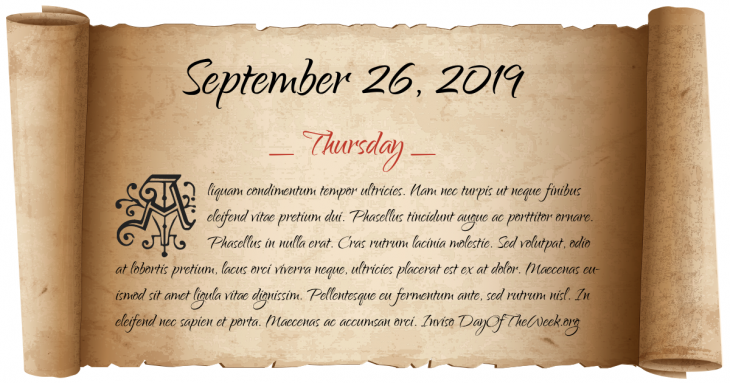 September 26, 2019 is the 269th day of the year 2019 in the Gregorian calendar. There are 96 days remaining until the end of the year. The day of the week is Thursday. The first battle of Shays’ Rebellion begins. Soviet military officer Stanislav Petrov averts a likely worldwide nuclear war by correctly identifying a report of an incoming nuclear missile as a computer error and not an American first strike. Who were born on September 26?